Detailed information on movable units, including design, floor plans, cost, transferring and moving out. Internal walls covered with cement sheeting or plasterboard. Capped waste outlet (for a washing machine if installed by occupant). We can fit the unit with ramps and extra grab rails. We can make other modifications as long as they don't affect the unit's structure. We may need some information from a doctor or occupational therapist to do this. The units do not have air conditioning. It can be installed with our permission but we do not pay for it. The units have separate gas and electricity meters. A separate water meter is not provided to the unit. There are two designs to choose from. The following diagrams are examples of the layout of a movable unit. 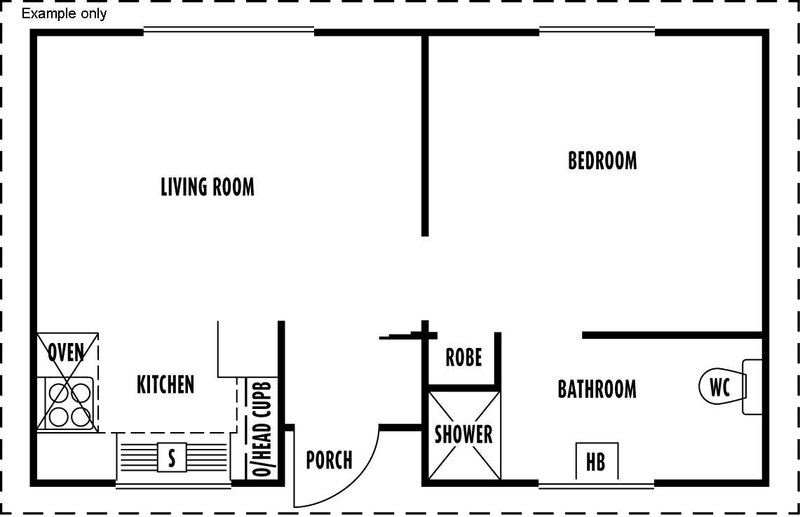 The layout, including kitchen and bathroom configurations and locations of windows, doors may vary depending on the type of unit. 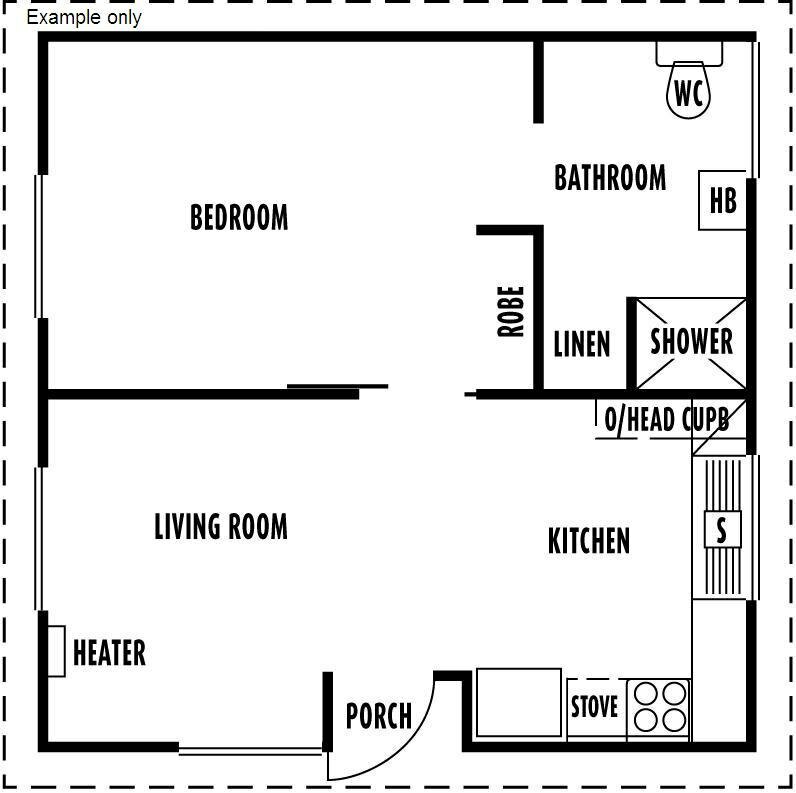 Most movable units are one-bedroom and there are some two-bedroom units. The hiring fee will not be more than 25 per cent of the occupant's income. If the occupant is on a pension or the unit costs more than 25 per cent of their income, they might get a rent rebate. Your local DHHS office can help with this. Variations to any property covenants. We pay insurance for the movable unit. This insurance does not cover deliberately caused damage. The occupant will need to pay for contents insurance if they want this. We do repairs and maintenance through the Housing Call Centre. See the maintenance and repairs on this website. In some circumstances, we may be able to help with moving the unit somewhere else. If this happens in the first 12 months, the occupant may need to pay for the costs which can be around $18,000. We must remove the unit when it's not needed any more. Arrange a final gas and electricity reading. It can take around three to four months to remove the unit after we are notified. Units should be in good condition and not have any personal things left in them.